Pearl River Mart can get loud. Like, really loud. The shrieks of joy peak around 3 p.m. I serve as president of the store, which has been my husband’s family business for almost 50 years. I often listen from the back office, which is packed with inventory boxes and temporary furniture, and separated from the main floor by a wall that doesn’t quite reach the ceiling. I hear every language imaginable — Chinese of course, Portuguese, Hebrew, Korean, Gujarati, French, Spanish, Russian, Japanese. I hear Southern drawls, Irish brogues, and booming dad voices. I hear extended families with strollers and wheelchairs, groups of friends on holiday, office workers stretching their legs and maybe looking for a salty afternoon snack. Every hour on the hour I hear the snap of an oversized cloth fan being opened with verve, often for the benefit of Instagram or Snapchat. The happy din makes me smile. I’m always amazed by the universal joy of the Pearl River experience and the sheer power of bringing people together to discover cool, unique stuff. It’s a simple, brilliant concept my husband’s parents have perfected over almost half a century of running this iconic New York City Asian emporium. My in-laws, Mr. and Mrs. Chen, immigrated from Taiwan in the late 1960s. Immigration laws had changed in 1965, allowing in more non-Europeans, and along with the Chens came a wave of students and skilled workers from all over the world. Mr. Chen earned a PhD in Chemistry from the University of Chicago while Mrs. Chen was a journalist with a background in economics. They would meet in New York City with other ethnic Chinese from all over Asia, including Singapore, Hong Kong, and the Philippines, where my own parents are from. The exception was mainland China. Since 1949, relations with the U.S. had been hostile, and trade was embargoed. The Chens and their friends were united in feeling kinship as ethnic Chinese. Country of origin mattered less than pride in being Chinese, especially in a place where immigrants were generally treated like outsiders. It was the Vietnam era, a time in which it wasn’t farfetched to think that one’s actions, even as young activists, could have an impact on global politics. Thus began Pearl River Mart. My father-in-law and three friends came up with the idea to open a “friendship store” as a political statement in 1971 (my mother-in-law would join a few years later). Having figured out a few creative ways to bring in embargoed goods, Mr. Chen planned to keep the store open for two years or so, just long enough to make a point: that there was nothing suspicious about these illegal items, that they were in fact tasty, beautiful, and fun—and that in turn, there was no reason to fear or discriminate against Chinese people. He would create a space that was welcoming to non-Chinese and comforting to Chinese, and perhaps, as a result, barriers would fall and hearts and minds would open. Pearl River founders Mr. and Mrs. Chen were ready to retire when their daughter-in-law, Joanne Kwong, offered to take over, refreshing the store with new products from up-and-coming designers and entrepreneurs and bringing it into the digital age while maintaining its colorful and welcoming atmosphere. Pearl River took off like a rocket from the first day. It was partly the novelty of the products (if there’s anything New Yorkers love, it’s goods that are illegal or in limited supply), but the longevity of the store, I believe, has more to do with the store’s essence, its reason for being. As my sister-in-law Michelle Chen has written, Pearl River was conceived as “part Fair Trade diplomacy, part nationalist enterprise, part Asian bodega, and totally New York City.” Over the years, Pearl River came to represent the very best qualities of our city and country: the resourcefulness of immigrants, the grit of American small business owners, and the open-mindedness and multiculturalism of a place like New York City. Five decades later, the addresses have changed, the product selection has expanded, and the vendors hail from all over Asia and America, but at its core, Pearl River still embodies these very special qualities. The saying by ancient Chinese philosopher Lao Tzu -- “When I let go of what I am, I become what I might be” – typifies the evolution of the store. Over five decades and eight physical locations, much has changed but not the original mission of celebrating culture and extending friendship. In 2015, the realities of NYC real estate and a new retail landscape dominated by Amazon had caught up with Pearl River. The Chens were facing a dramatic rent increase in SoHo from $1 million to $6 million a year. Consequently, they announced that Pearl River would be packing up. The city gasped, got angry, then lamented. Scores of elegies were written in publications as varied as The New York Times, Vogue and Jezebel (“RIP Pearl River Mart, the Best Place in New York to Take Your Mom”). Another NYC institution had bitten the dust. Wilkie Wong checks the price of a ceramic vase. One of Pearl River’s longest serving employees, Wilkie started working at the store as a high school student and stayed for 36 years, rising to Vice President. I was sad, too. Pearl River was not just my husband’s family business; it was a part of my own childhood. I grew up in Astoria, Queens, and, like many Chinese families in the tri-state area, my family came to Chinatown every weekend. Despite the fact that my parents spoke English well and were friendly with their non-Chinese co-workers and (generally Greek and Italian) neighbors, our family’s universe was based in Chinatown. On the weekends, we would shop for groceries, and of course, yum cha. We would drop Popo off at the Jee Family Association, where she played mah jong for hours on end. Armed with sacks of dim sum and tangerines to sustain us, we would sometimes spend whole Saturdays at the Chinese movie theater watching the latest kung fu double-features. We came to Chinatown for doctor’s appointments, new jeans, haircuts, and glasses—and if we were lucky and obedient, we got to ascend the rickety steps on the corner of Canal and Broadway to enter the world of Pearl River, with its promise of toys, sweets, and curiosities. 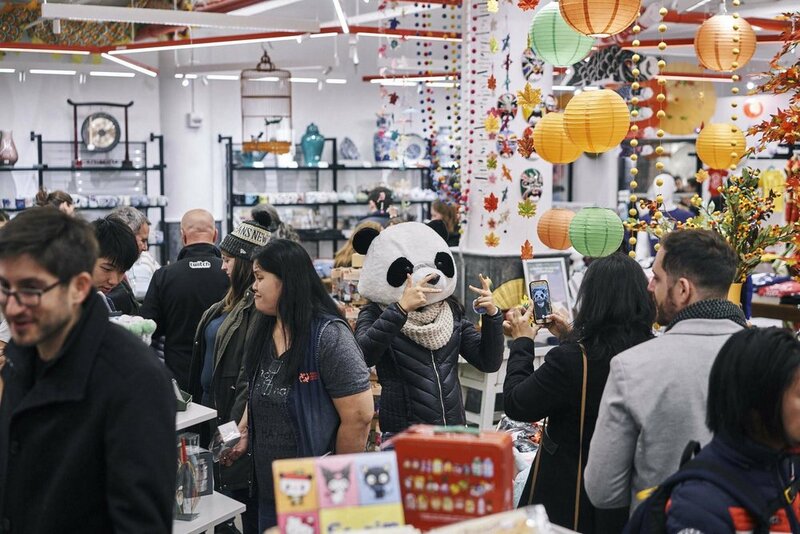 A typical -- and very crowded -- Saturday afternoon in the Chelsea Market store, complete with panda head pics. New York City was still gritty back then, and unlike today, the city was not well appointed for kids. Our playgrounds were grimy, the subways full of graffiti, and Halloween truly was the scariest day of the year. Pearl River was, on the other hand, a cheerful haven that delighted everyone, adults and kids alike. Its customer base was unusually broad – both Chinese and non-Chinese, male and female, young and old, haute and working class. It was the first cross-over “brand” I had ever known. When I was young, my dad used to impart mini-lectures about being Chinese. He wanted my sister and me to know that Chinese history is long, and that each generation improves the lot of the past generation. That we were playing a role in a longer story. That our choices weren’t ours alone — that they affected our family, community, and perhaps even history. When the roots are deep, a proverb says, there is no reason to fear the wind. There’s never a great time to disrupt one’s family, life, and livelihood, but when Pearl River closed, I thought about the struggles of the Chens, their employees, and my own parents as young immigrants; the self-consciousness of second- and third-generation kids like me who grew up with few Asian leaders and establishments to model ourselves after; and the tremendous potential to change the environment for the next generation by simply venturing off the beaten path and taking a risk. I thought about the loss of a New York City and Chinatown institution as well as a proud symbol of Asian American advancement in this country. I thought about how bummed I’d be not to have a place to buy decorations for Lunar New Year, or soft velvet beaded house slippers, or White Rabbit candy. I had no retail experience and little idea of what I was getting myself into, but what I did have was New York street smarts, a liberal arts education, and a varied career that has trained me to run teams and projects. My husband and I decided to raise our hands and jump in. Working side by side with my in-laws, I would join Pearl River as its new president, and my husband would continue his engineering business to keep food on the table. On my very first day, I reported to an HVAC-less basement warehouse off Cortlandt Alley where the entirety of five decades of Pearl River was temporarily being housed: all of the inventory that didn’t sell, the Chens, four longtime employees, and a few computers that needed updating. I sat with everyone to learn the business and found myself getting caught up in the stories. Wilkie, who came to Pearl River as a high school student when his Burmese family immigrated from Macau, stayed for 36 years and rose to vice president. Arthur, who grew up in the playgrounds of Chinatown’s far east side, serves in many capacities, including as our entire IT department, in-house photographer and expert box packer. Lance, the only non-Asian at Pearl River for decades, who doesn’t speak Chinese, but pronounces Cantonese names pretty damn well. A rare retail store whose devoted customer base runs the gamut from young to old, haute to bargain-hunter, New Yorkers to everyone else. The rest of our “old” staff trickled back as we prepared for our comeback. Most came to Pearl River in the ‘80, ‘90s and aughts as an alternative to working in Chinatown restaurants or garment factories. The Chens supported them through weddings, childbirths, and funerals. Language wasn’t a barrier to the job — in fact, gruff behavior was part of the Pearl River experience. Not because the staff were gruff but because sometimes getting your point across when you don’t speak the language is hard. My Mandarin and Cantonese are not great, so I can understand the feeling. One morning during those early days, I scheduled our first all-staff meeting. I was nervous because I knew how vital it was for me, their new leader, to gain the staff’s respect, to articulate my plans for the future, and to set the tone for this new enterprise upon which we were embarking. I knew I had to speak in Chinese. And I wished desperately that my parents had not listened to 8-year-old me when I refused to enroll in weekend Chinese school. I outlined the topics I wanted to discuss and burned up Google Translate trying to figure out how to explain Instagram, experiential retail, and customer service culture on a third-grade Chinese vocabulary. It turns out I needn’t have worried. As I began to speak, it became apparent to me that the staff thought they had been gathered to hear bad news. When it became clear that I simply wanted to begin a personal relationship, and that I had taken the trouble to communicate in Chinese as opposed to English, I saw the furrowed brows loosen and shoulders relax. The hour flew by with lots of laughter, and while I’m not sure if anyone understood anything I said about social media, the larger point had been made. The experience seemed to validate Mr. Chen’s original notion from all those years ago: that fears, barriers, and negative assumptions disappear just by getting people in the same room to learn and share from a place of mutual respect. This doesn’t just apply to differences in race or ethnicity; it applies to generational, class, and educational differences as well. In 1971, Mr. Chen would drive 18 hours back and forth to Canada each week to bring in goods from mainland China, which were embargoed at the time. After almost 50 years, Mr. Chen still drives the Pearl River truck to and from each of the stores and a Brooklyn warehouse. Two years have passed since Pearl River’s return in November 2016. So much has happened; it makes me immensely proud but also a little scared since our future still does not feel secure. And yet – we opened three stores in two years, including our newest location, within the esteemed Museum of Chinese in America. We’ve updated and expanded our inventory. Built an art gallery to exhibit Asian American artists. Collaborated with emerging designers, authors and entrepreneurs to give them a boost. Hosted numerous events that were friendly to multiple generations and made people smile and proclaim their love for New York City. Celebrated Lunar New Year on the local news and smack dab in the center of iconic Chelsea Market. Rehauled our digital efforts and created content that Asians in Des Moines, Toronto, and Sydney could access and, in so doing, become a part of our community. Many of our “new” staff hired in the past two years are second generation, or di er dai. Others are Asian but not Chinese; part-Asian; adopted Asian; or not Asian at all. So many opportunities are available to them, yet they choose to work here. As a group, we’re fluent and fluid in many cultures, as New Yorkers often are, and each of us is united in our admiration for the Chens and our own personal enjoyment of the store. It’s heartening to see the youngsters love the legacy of the Chens as much as I do, and squeal with delight when we bring in new “exotic” snacks, kawaii Sanrio products, or items created by cool up-and-coming designers. When our employees excitedly recommend their favorite items to the thousands of customers who pass through our Chelsea Market and Tribeca stores every day, I feel proud that I’m keeping the Chens’ mission of friendship alive and well. We often don’t realize how important an individual or institution is until we read an obituary or see the for-rent signs. In these fast-moving times of personal brand building and individual achievement, it’s easy to forget that communities still matter. History still matters. Face-to-face interaction still matters. And remaining bright and positive during times of darkness and ignorance can be powerful. My in-laws have provided me an inspiring blueprint to follow. For decades, they’ve been guided by their beliefs first, personal stakes second. They own a business, but the business does not own them. Time after time, they’ve chosen the light, the right thing to do. Always looking on the bright side, after both disappointment and triumph. Always extending a hand, assuming the best intentions of others. Always moving forward, not looking back. It’s an astonishing legacy, and one that has served as an example to me, both in business and in life. The world has changed quite a bit since 1971. With Beijing, Seoul or Manila only a half-day flight away, and Asians making up the fastest-growing racial or ethnic group in the U.S., there is no longer a need to “introduce” Asian culture to New Yorkers. Yet Mr. Chen’s original desire for friendship, for breaking down barriers, sadly remains as relevant today as ever. Fifty years later, insidious stereotypes and bigotry still persist. Neighbors shout at each other in subway cars and over social media, and xenophobia has been sanctioned by our highest leaders. Whereas the Chens and their generation had to deal primarily with base ignorance about them and their homelands, Asian Americans today, in all of our increasing heterogeneity, face a wider and more complex panoply of issues – many related to lack of unity and thus political representation, as well as the usual stereotyping, bigotry, and persistent inequality related to employment, education, and health care. Asian Americans are also still largely invisible. With only a handful of precious exceptions, we are statistically absent in fields of influence like entertainment, advertising, and politics, and almost completely missing from leadership roles at major businesses and institutions. Yet in 2019 a sense of energy and movement is afoot, and it feels exhilarating and totally unknown. The stars literally aligned in Hollywood for #AsianAugust, the month when three (really wonderful) films written by and starring Asian Americans – Crazy Rich Asians, Searching and To All the Boys I’ve Loved Before – were released. In politics, no fewer than 80 AAPI candidates ran for Congress last year, and there are even two declared Asian American presidential hopefuls, Kamala Harris and Andrew Yang. Athletes with the surnames of Lin, Kim and Shibutani are cheered by Asians and non-Asians alike, and Asian American designers like Jason Wu, Alexander Wang, and Carol Lim and Humberto Leon of Opening Ceremony dominate New York Fashion Week. For each film made, candidacy declared, or title won, there suddenly seems to be much more at stake than just that single achievement. Being Asian American is still a relatively new concept, and it feels like these individual efforts are atoms swirling around, combining and joining together to form bigger, grander, stronger compounds. People often ask me how I feel about leaving a comfortable life behind and entering the notoriously imploding world of retail. I tell them: I have no idea if this will end well but this is where I need to be right now. Our community is at an inflection point, and we need as many people as we can to propel us to the other side, wherever that may be. My contribution – keeping a beloved cultural store open – may be small, but it is a solid, tangible stitch in the fabric of our community. Mr. Chen felt the same way about his “humble” act of opening the store in 1971, and I couldn’t be more proud that Pearl River remains a vibrant beacon of intergenerational pride for our community. Standing tall, looking both forward and back, playing its part in a much longer story. A new generation of Pearl River employees grew up loving the store and are now shaping its future. We had a celebratory staff dinner after hosting lion dances, dumpling tastings, and Asian American influencer parties for Lunar New Year. We’d been on multiple morning news programs and decorated parties all across town. We were exhausted, but over shrimp and walnuts and Chinese-style lobster, our tables shook out into the same factions that you would see at a big Chinese wedding: the families with kids and grandparents, the aunties chit-chatting, the younger hip crowd, and the high schoolers slumped over their phones. I closed my eyes for a moment to listen. I heard laughter and selfies being taken; Cantonese, Mandarin, and English spoken; the kids’ iPads beeping; dishware clanging. I looked over and saw that the Chens were tickled, as I was, by this brand new team and chapter for Pearl River, one that unapologetically celebrates culture, history, and friendship. When the roots are deep, there is no reason to fear the wind. Fifty years later, the story — and Pearl River — rolls on. Visit Pearl River Mart at their Tribeca flagship and at their satellite locations in Chelsea Market and the Museum of Chinese in America. Shop online here, and follow them on Instagram, Twitter and Facebook for the latest news.